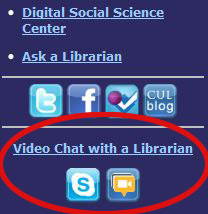 The Journalism Library is excited to launch a new cool service to assist you with your research – video chat reference – which will enable you to connect with a librarian using Skype or Google+ Hangouts. Enjoy virtual face time and screen-sharing demonstrations, all from the comfort of your couch. In addition to video chat "Walk-in Wednesdays," you may make evening and weekend appointments for video chat research assistance. Take a look at the instructions for using these video chat technologies – and book your appointment today! This entry was posted in Columbia University Libraries, Service Announcements, Widgets & Tools and tagged cool stuff, reference, services, video chat on March 13, 2013 by Cris.